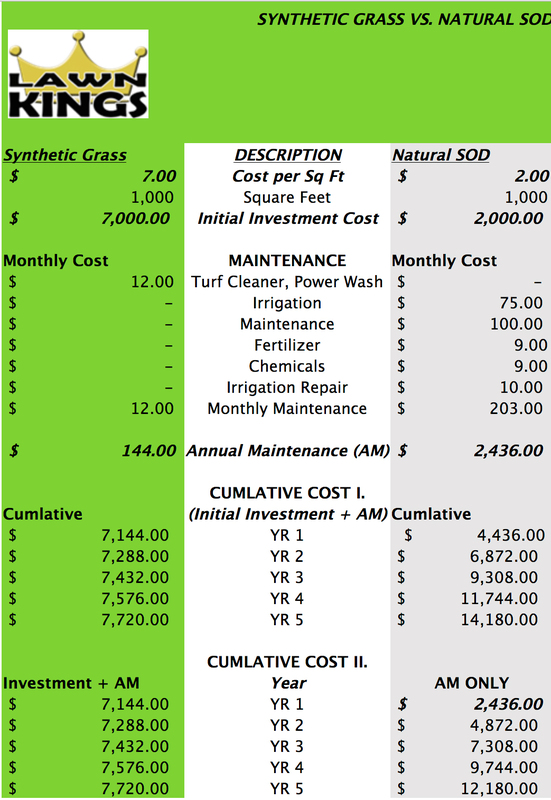 Lawn Kings, Inc. – Why Synthetic Grass? In our +20 years of experience of installing synthetic grass, we find homeowners choose synthetic grass for many of the same common-sense reasons including and ranging from; little to no maintenance, water conservation, a long lasting beautiful look, and a pet friendly installation that prevents odors. One aspect of synthetic grass that is not often promoted or explained is the “clean” aspect of the synthetic turf itself in combination with a high-quality installation. In line with this we’d like to enlighten and inform those of you who might be interested in this topic. 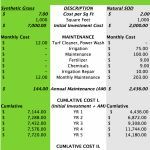 Oftentimes the turf manufacturers and its sales team focus on “product sales” rather than providing the homeowner a bigger picture view on one of the least mentioned but real benefit of a synthetic grass installation – in a word, “clean”. On another note, we suggest you stay away from synthetic grass product with a latex backing which is often the least expensive. A couple of reasons; as you may know there are some individuals that have a latex allergy, obviously the product choice isn’t a good one for those individuals. The other reason to avoid synthetic grass with a latex backing is because latex absorbs water and other liquids. The result, without a long explanation is that the turf will tend to wrinkle up as it absorbs the moisture, very often the worst-case situation occurs in the height of summer. Imagine a synthetic grass installation in fall, before the seasonal rains, here in Southern California. Later in in winter it is rained heavily upon and several months later, the intense summer heat works hard to expand whatever it comes into contact with. This then, is the most likely time for wrinkles or humps with that product. Our materials prevent this from happening as does our installation process, one method our installation utilizes involves a technique that stretches the turf taut over the base prior to fixing the turf in place. Maintaining good looking grass can sometimes be a pleasant and enjoyable use of homeowner’s time, especially with the purchase of your first home. On the other hand, maintenance of natural sod so that it continues to look good and healthy sometime after initial installation can sometimes be a challenge. Particularly in a hot and arid climate such as in Southern California. The root cause of the challenge may not truly be classified as maintenance but rather the underlying soil condition, invasive weeds like nut grass, pet urine, lack of sunshine, landscaper’s equipment bringing in weeds, etc. Natural soil and sod typically attract a variety of bugs, grubs, mosquitoes, and as well as gophers, rabbits and we’ve seen raccoons even in some yards digging for a food source. In addition, natural sod requires products such as; fertilizers, weed killers, and associated chemicals, to maintain the lawn in good shape. While these products are helpful and wouldn’t say they are harmful but in our opinion, we are thinking these products are close to the opposite of “clean”. The literal foundation of a high-quality installation is the compacted sub-base that is situated under the entire synthetic grass area. Just a real quick overview of how the base is installed. We dig down about 3” and remove sod and natural soil (we call this demo – short for demolition) and haul off, it’s a lot of hard physical labor. Once done, we bring in a material technically called “Class 2 Road Base”, the optional material is called DG (decomposed granite) it is compacted to about 95% compaction. And why? It is because if turf were installed on natural soil it would not be installed on a firm surface and it would wrinkle or bubble up. PERMEABLE – the base can be thought of as a “French drain” the CII Base Material is essentially ¾” gravel with some fines in it, so in addition to it compacting well, it is also very permeable. CLEAN – the base certainly is clean in that there is nothing for the worms and grubs or gophers and other critters to be interested in. The result is no standing water for mosquitoes and animals have no attraction to the area. LAWN KINGS – CLEAN – the “clean” aspect is one of the most understated and unexplained reasons to consider synthetic turf. Contact Lawn Kings today for a FREE Synthetic Turf Estimate, we’d appreciate the opportunity to understand your needs and requirements.